FT. LAUDERDALE, Fla., April 15, 2014 /PRNewswire/ -- When we want to cool off on a sweltering South Florida summer day, we just flip a switch and crisp, cold air floods our homes and workplaces. But in pre-air conditioning South Florida, people had to be a little bit more creative. Starting Saturday, May 2, the Fort Lauderdale Historical Society will present "Beating the Heat: Surviving Summer in South Florida" – at the H. Wayne Huizenga Exhibit Room at the New River Inn. Featured in the exhibit will be the myriad of ways those earlier residents cooled off, from architecture to undergarments. 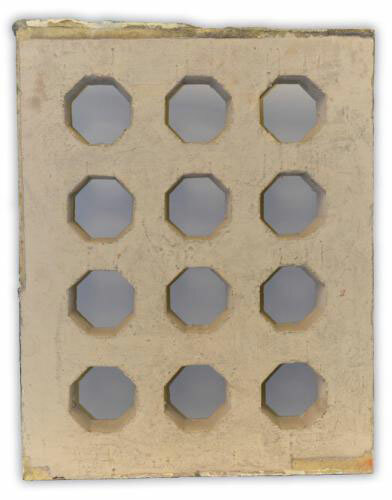 One way in particular will be a prominent part of the display: cement window grates. "Designed by Francis Abreu, Fort Lauderdale's most prominent architect of the 1920s, these innovative cement window grates provided a large degree of sunshade, privacy and security for the home's occupants, while still allowing adequate airflow during the summer," said Merrilyn Rathbun, Director of Research Services for the Fort Lauderdale Historical Society. Made out of concrete and measuring 29 by 37 1/2 inches, each grate weighed over 200 pounds and contained 12 holes for air to pass through. Before it was demolished, the Gypsy Graves House, formerly located in the Rio Vista neighborhood, was an expansive Mediterranean Revival style home designed by Abreu that contained many of the grates. Luckily, even with the demolition of the Gypsy Graves House, you can still catch a glimpse into how South Floridians of the past beat the heat. The exhibit will run May 2 thru May 23, 2014 at the 1905 New River Inn is located at 231 SW Second Avenue, Fort Lauderdale, Florida. Hours are Tuesday through Sunday Noon to 4 PM. Admission is $10 and includes a self-guided tour of the New River Inn and a docent-led tour of the 1907 King-Cromartie House and the 1899 Replica School House. Docent-led tours begin at 1 PM, 2 PM and 3PM. The Fort Lauderdale Historical Society (FLHS) brings the history of greater Fort Lauderdale to life through education, research and preservation for the enrichment of present and future generations. Believing that a sense of history is fundamental to understanding human experience, the FLHS collects, preserves and shares material from our community's past, so that present and future generations can comprehend more fully their predecessors, their community and themselves. With education as the primary focus FLHS offers public lectures and workshops; publish teacher resource materials; arrange school and general group tours and activities; support scholarly research through significant research assistance; maintain a 1907 house museum and three other 1905 historic structures, and a museum of changing and permanent exhibitions, and operate a research center that has functioned uninterrupted for more than 50 years. Visitwww.FortLauderdaleHistoricalSociety.org. The Fort Lauderdale Historical Society is a 501(c)3 organization.